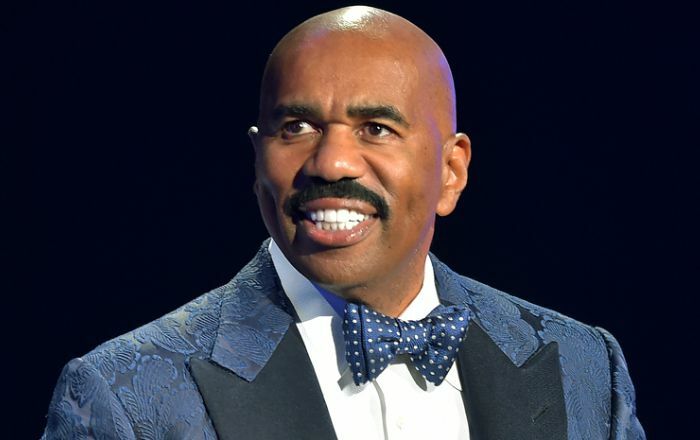 Steve Harvey is quite a well-known comedian, actor, television host, producer, author, and radio personality who has been active in television circuit since 1985. He is a decorated host of hit TV shows like The Steve Harvey talk show, Family Feud, The Steve Harvey Morning Show, and Little Big Shots. He is a five-time Daytime Emmy Award winner, two-time Marconi Award winner, and a 14-time NAACP Image Award winner in various categories. Comedian, Television Host, Producer, Radio Personality, Actor and Author. I’m going to take this God-given gift of being funny, and I’m going to spread it out like peanut butter on everything I do. Steve Harvey was born on 17 January 1957, in Welch, West Virginia, USA. He’s currently 62 years old. Steve graduated from Glenville High School in 1974. Later, he attended Kent State University and West Virginia University. Harvey has been married three times. He was married to his first wife, Marcia Harvey, from 1980 to 1984. They have three children, twin daughters, Brandi and Karli, born in 1982 and a son, Broderick Steve Jr., born in 1991. Steve then married his second wife, Mary Lee Shackelford, in June 1996. The couple divorced in November 2005. From their nine years of marriage, they have a son together named Wynton (b. 1997). He later married his third wife, Marjorie Bridges, in 2007. From this marriage he became step-dad to three children – daughter Morgan Harvey (b. 1987), son Jason Harvey (b. 1991), and daughter Lori Harvey (b. 1997). Steve and Marjorie have four grandchildren: two through Jason’s marriage to his wife Amanda, one through Morgan’s marriage to her husband Kareem and one through Karli’s marriage to husband Ben. You can be happy, or you can be right. If you want to be part of a couple and win every argument, you’re in trouble. You’ve got to be in a bad relationship to really understand what a great one is. Steve made his acting debut with the 2000 stand-up comedy film The Original Kings of Comedy as himself. Harvey has garnered international fame and recognition for being a television host for over three decades. He began his television journey as a host in the syndicated music television show Showtime at the Apollo from 1993 to 2000 and 2016 to 2017. Best known for his shows The Steve Harvey Show, Family Feud, Celebrity Family Feud, Little Big Shots, Steve Harvey’s Funderdome, Little Big Shots: Forever Young and Steve. Steve has endorsed many brands and products including BlackPeopleMeet.com, Glory Foods, Green Dot and many others. He has also appeared in TV commercials for Burger King, Strayer University commercials, among others. His total net worth is estimated to be $140 million US dollars. That money comes from his TV shows and he makes around $40 million per year from his appearances on TV, films and other events. Besides, Steve is also a film producer, screenwriter, and author. He dives his times between Atlanta, Georgia, and Chicago. I’ve been truly blessed… with both a dedicated, hard-working team and the best fans in the entire world. The 2018 #DaytimeEmmy nominations for @stevetvshow and @familyfeud are thanks to ALL OF YOU, and I couldn’t be more humbled. Thank you and God Bless. You’ve got to quit lowering your standards. Set your requirements up front so when a guy hooks you, he has to know this is business. His first name is Broderick, named after actor Broderick Crawford of the TV series Highway Patrol. Steve did several jobs such as a boxer, an autoworker, an insurance salesman, a carpet cleaner and a mailman before landing as a comedian. During his initial days as a stand-up comedian, he was homeless for multiple years and slept in his 1976 Ford, when he doesn’t have shows. Steve is a member of Omega Psi Phi fraternity. He is a diehard Cleveland Browns fan. Steve has won several awards in a career spanning over three decades including five Daytime Emmy Awards, two Marconi Awards, and fourteen NAACP Image Awards. In 2013, he received a star on the Hollywood Walk of Fame. In 2014, he launched his own dating website titled Delightful.com. His published works include Act Like a Lady, Think Like a Man (2009) and Straight Talk, No Chaser: How to Find and Keep a Man. During the 2015 Miss Universe pageant competition, Steve mistakenly named the first runner-up, Miss Colombia, Ariadna Gutiérrez, as the winner. He later announced that he had read the results incorrectly and that Miss Philippines, Pia Wurtzbach, was the new Miss Universe and apologized to both the contestants. He returned as host for the Miss Universe 2017 pageant in Las Vegas on November 26, 2017.